I looked up at the ropes course. The wires and ropes were tiny. I put on a brave face knowing that ever since 2 knee surgeries and another torn ligament my balance has never been the same. This was going to be an adventure! The first warm-up challenge at the Awesome Adventures Rope Course, located in Overton, Nevada, looked easy enough. That was a relief. But I realized that appearances are deceiving. While the wooden steps were large enough for both of my feet, my balance was tested as I took a giant step to reach the next one. I had no illusions that the next course would be easy. As I tentatively put my foot on the first narrow wire, my whole body shook. Lean on David, instructed Stoney from below. I took a deep brief shaking as I let go of the rope and leaned on David. The purpose of this exercise is teamwork and learning to trust your partner – you’re in this together. I didn’t make it easy for David, but step by shaky step we made it across! I was on my own for the next few exercises with David there to help me and Stoney to instruct me from below. Let go of the rope, advised Stoney from below. I was harnessed in and if I fell, I wouldn’t have fallen very far. It wasn’t a matter of safety, it was a matter of trusting myself. Of knowing that I could do it alone – that I didn’t need the rope. Just when you think you’ve got the hang of it, the course changes. The next course, you had to lean into the rope. I felt like I was going to fall forward. I had to trust that I wasn’t (and even if I did my harness would have caught me). Step by step, still shaky, but less so I made it across. The next course required even more co-ordination – not only balancing, but also reaching for the ropes to help get you across. Step-by-step I did it. I love challenging myself and the Ropes Course did that. I went in knowing that my balance wasn’t great, but still did it. I started off really, really shaky, but as I progressed and my confidence grew, I became less shaky. I still wasn’t effortlessly walking them as David was, but I did them! In so many ways, it reminded me of how we face challenges in other aspects of our life. When we tell our ourselves we can’t, then we often don’t even try and don’t give ourselves the chance to see what we’re actually capable of. When we try something that we know will be a challenge, we often surprise ourselves about what we can actually do, and perhaps even do better than expected! Through Stoney and David’s encouragement I did it! And more importantly I was reminded that we can often do much more than we believe we can! So how to top off a ropes course? With a zip-line of course! It’s located in Overton, Nevada. Hotel pick-up from Las Vegas is possible or you can drive there yourself. It costs $49. You can purchase it directly through Awesome Adventures. 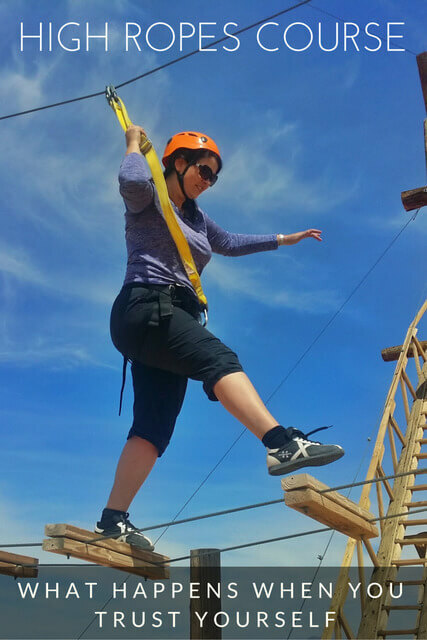 While the ropes course is challenging, Awesome Adventures has a Challenge by Choice philosophy, meaning that you will be pushed outside of your comfort zone, but not more than you choose to be. The owner, of Awesome Adventures, Stoney, who is also a life coach, has an art of knowing how much to push you, and when it’s enough. He’s installed his philosophy in all of the ACCT Certified Facilitators. One of the reasons I love Ropes Courses is because they push you outside your comfort zone. The confidence you gain on the course stays with you long after the course is finished! I thoroughly enjoyed the Ropes Course, but my adventures weren’t quite finished for the day – there was rappelling to be done! Stay tuned…..
Disclosure: Many thanks to Awesome Adventures for making my Ropes Course possible. As always, all opinions are my own.